Don’t give up on exfoliation. No matter your skin type or what woes you’re dealing with, exfoliation IS the key to the brighter, smoother and pimple-free skin you crave. But then… why does exfoliation often backfire? The problem is not exfoliation itself. It’s what you use to exfoliate. That’s right. Different skin types have different needs. They need different exfoliators to fulfil them. Question now is, how do the heck do you know which one is right for YOU? First thing first: what the heck is the point of exfoliation? Exfoliation does wonders for your skin. It removes the dead cells that accumulate on the surface of the skin. You see, those dead cells have been there for a while. They’ve been attacked by UV rays, pollution, germs and all other sorts of skin enemies. Day after day, they’ve suffered so much damage, they’ve become rough to the touch, developed a darker colour here and there, and lost all their glow. Get rid of them and you expose the newer skin underneath. These new cells didn’t suffer much damage yet, so they’re softer to the touch, even in colour and have a glow of their own. Exfoliation doesn’t just make you look younger overnight. Now those dead cells are out of the way, your skincare products can penetrate skin better and faster. One more thing: some exfoliators can get inside the pores, unclogging them from within. Bye bye breakouts! How Do You Exfoliate Skin? Did you know your skin can exfoliate on its own? Problem is, as you get older, this natural exfoliation process breaks down. Your skin can’t exfoliate as well as it used to on its own. You can tell when this is happening. You skin becomes rough. It loses its glow. You may get more pimples than before. Basically, if you’re using a scrub or a “cleansing device” (they’re exfoliators in disguise! ), you belong to Team Physical Exfoliation. Physical exfoliation is the most popular type of exfoliation. Heck, for years, those harsh apricot scrubs were all you could find at the drugstore! Related: Is The Clarisonic Good Or Bad For Skin? Don’t let the name scare you. Chemical exfoliation is a gamechanger. Chemical exfoliation uses acids to dissolve the “glue” that holds skin cells together, so they can slough off. I know it sounds painful but it’s not. Not unless you abuse it. Exfoliating too much or too often always leads to irritation. In small doses, chemical exfoliators are way gentler than scrubs, exfoliate skin evenly and go the extra mile. Alpha Hydroxy Acids: they’re suitable for dry and sun-damaged skin. The most famous members are glycolic acid and lactic acid. Beta Hydroxy Acids: they’re suitable for oily and acne-prone skin. Its most famous remember is salicylic acid. Exfoliation is like magic for your skin. But even good magic can terribly backfire if you do it wrong. You see, those dead cells are there for a reason. Their job is to protect the living cells underneath. If you remove too many layers of dead cells, you expose the rawer cells that weren’t ready to come to the surface yet. Salicylic acid. This beta hydroxy acid is the best exfoliator for oily skin – bar none. It exfoliates skin in two ways. It removes dead cells from the surface of the skin, and then penetrates inside the pores, getting rid of all the crap that’s clogging them up. Bye bye blackheads & breakouts. This is the skin type that better tolerates exfoliation. I recommend you start exfoliating three times a week. But, if your skin can take it, you can gradually increase frequency. Glycolic acid. This alpha hydroxy acid doesn’t just get rid of dead skin cells. It also boosts the production of collagen and hydrates skin. That’s something your skin badly needs! Glycolic acid is awesome, but don’t overdo it. Two or three times a week is enough. Salicylic acid to unclogs your pores and glycolic acid to hydrate skin. You can use different exfoliants on different areas of your face or opt for exfoliators who have both. Two or three times a week. If your oily areas are very oily, you can slowly increase frequency there. Your skin is able to exfoliate on its own. If it’s soft and glowy, leave it be. But if, as you get older, you notice it starts lose its luster and become a little rough, go for a glycolic acid exfoliant. It’s the best exfoliator for your skin type because it boosts the production of collagen, helping to keep wrinkles at bay. Go easy on exfoliation. Your won the skincare lottery so don’t mess it up now! Once or twice a week is more than enough. Your skin is very delicate so you need to use the gentlest thing you can find. That’s either a washcloth or lactic acid. Lactic acid goes the extra mile: it hydrates skin too. Once a week. For your skin type, it’s more than enough. Related: Glycolic Acid VS Lactic Acid: Which One Is Right For You? Exfoliation is for everyone. 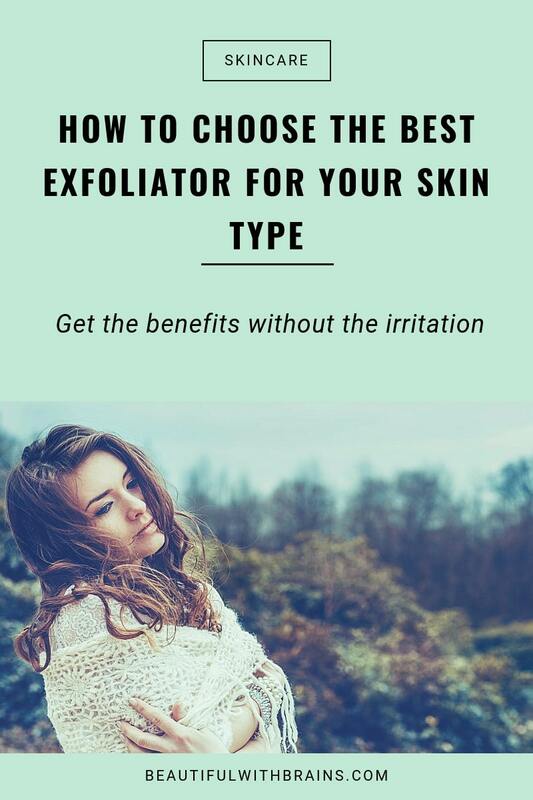 The key is to find the best exfoliator for your skin type and needs so you can get brighter, smoother skin without any side effects. Do you know what the best exfoliator for your own skin type is? Share your picks in the comments below. Oh gosh.. I have dry/normal skin with hyperpigmentation, especially around the nose. How often should I exfoliate? I usually do it about 3 times a week. Is that too much? OMG! I love your page! it as a beauty book! very helpful and so exciting always! Renee: I didn’t think exfoliation was important and for years I wouldn’t bother. But now I do it I can see a difference. My skin looks brighter and helathier and active ingredients in skincare products penetrate more easily and can therefore do their job better. If your skin is very sensitive, just using a washcloth to slought off dead cells once a week should be enough. Danielle: if three times a week works well for you and you haven’t had any side effects (ie red or irriated skin) then it shouldn’t be too much, but I definitelky wouldn’t exfoliate more often than that. Nikki: you’re welcome. I think anyone can exfoliate as long as they use the right products for the skin type. If you use something that’s too harsh for your skin, it’s only gonna cause problems and irritations. Alright, you’ve convinced me! 🙂 I’ll start researching on some gently exfoliators. Will probably look at the Clinique counters though, as I love their products. 😛 Thanks! Renee, I love Clinique products too although I haven’t trid any of their exfoliators yet. Using the right products for your skin typ does make a huge difference. If a product is too harsh it could cause irritations. I think exfoliating once a week is really important. I find if I haven’t done it in a while my forehead gets flaky and my overall face looks dull. Vanessa, I agree. Exfoliating is really important and makes a great difference in how your skin looks. Question, is it true you should not exfoliate when pregnant? Maya, it depends on what you use. Salicylic acid is not recommended. Glycolic acid is controversial because some experts say it’s ok while others that we don’t have enough data to know for sure. Lactic acid is ok. Exfoliation with a washcloth is fine, too. Amazing post, thank you for sharing. Could you tell us how to exfoliate skin during the spring and summer, if we don’t wanna use BHA/AHA? What is the alternative for BHA/AHA that doesn’t make our skin photosensitive? Jelena, ANY form of exfoliation makes skin photosensitive. It’s removing dead cells and exposing the newer layers underneath that makes you more prone to sun damage. So I’d say, use your acids less often and make sure to wear sunscreen every day and you’ll be fine.